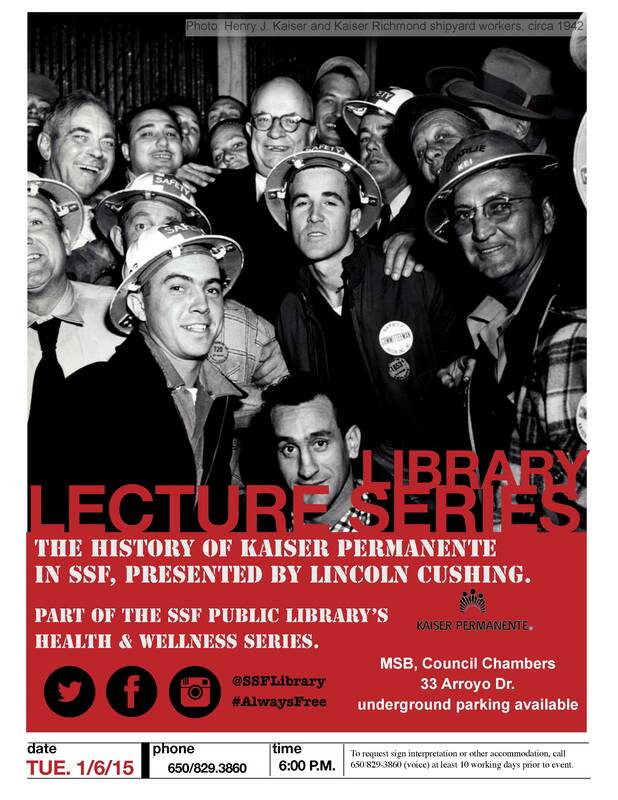 Kaiser Permanente historian Lincoln Cushing will present a slideshow about the origins of the health plan that opened to the public in 1945. Learn about how industrialist Henry J. Kaiser paired up with physician Sidney Garfield to build a system of health care and hospitals that now serves as a model for the nation. This presentation will explore the evolution from early service to workers in the Mojave Desert, the Grand Coulee Dam, the seven World War II shipyards, and the Fontana steel mill, to post-war care for union members and their families that resulted in massive California expansion – including facilities in South San Francisco. Lincoln Cushing is the lead archivist at Kaiser Permanente. Cushing has worked as an archival consultant at the Oakland Museum of California and Clorox, and as a Spanish-language cataloger and electronic outreach librarian at UC Berkeley. He has authored numerous books on social justice poster art of the late Twentieth Century. This free event is part of our Health & Wellness in the Library series. It will take place Tuesday, January 6, 2015 at 6:00 PM at the Municipal Services Building, Council Chambers, 33 Arroyo Dr. Underground parking is available. For more information or to request sign interpretation or other accommodation, please call 650-829-3860 (voice) at least 10 working days before the event. Connect with us on Facebook, Twitter & Instagram.